All-New Hyundai Santro: This is What It Looks Like. We have already had a quick but detailed look at the new Santro but were not allowed to take photos or videos of the same. Hyundai has revealed two official images of the car for now, but new spy shots have also surfaced, showing almost everything about the new hatchback weeks before its launch. Set to be launched on 23 October 2018, the new Santro will be offered at a special introductory price for the first 50,000 people who have placed a confirmed booking for one. The car spied has the Asta trim, which could be the top-of-the-line variant in the Santro lineup. While the white exterior paint hides some of the creases and body lines, it does reveal how the car will look in what could be the most popular colour for the car once it is launched. 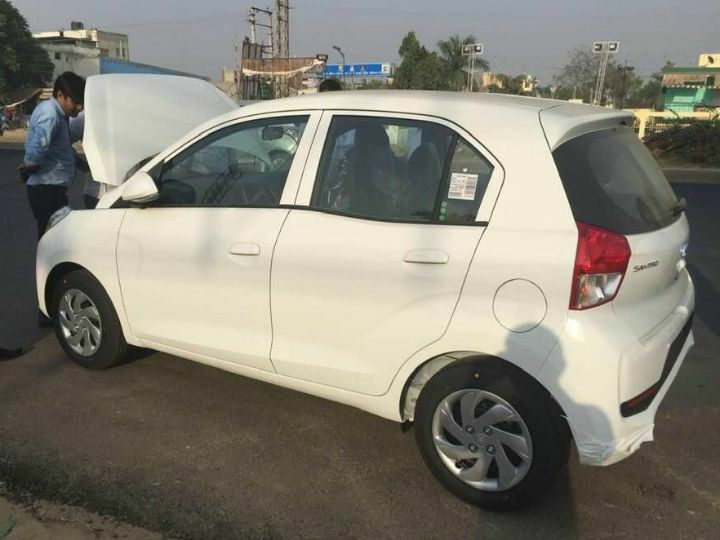 The new photos show how the Santro will look on the road, and from the front, it looks like a modified, now discontinued, i10. The headlamps look more angular and stretched versions of the ones on the i10. The front fascia is dominated by the company’s signature ‘Cascade’ grille, this is flanked by the rather high-set fog lamps. A hexagonal chrome strip adorns the grille, while more chrome can be found inside the headlamp cluster. The bumper does get some surface details, including extensions on the edges. The hood (which has not been shut properly in the photo) also gets some character lines to keep things interesting. The ORVMs, which are partially body-coloured, have integrated LED indicators. Pull-up type handles are offered as standard, though it may not be body coloured in all variants. The kink on the rear window is less noticeable in these photos, maybe because of the colour used. The full-sized wheel covers for the 14-inch steel wheels can also be seen here — again, these may not be offered as standard on the range. The rear angle shot shows us the ridged roof, which is done to make the car stiffer. The spoiler-like roof extension on the hatch door houses the washer for the rear windshield. 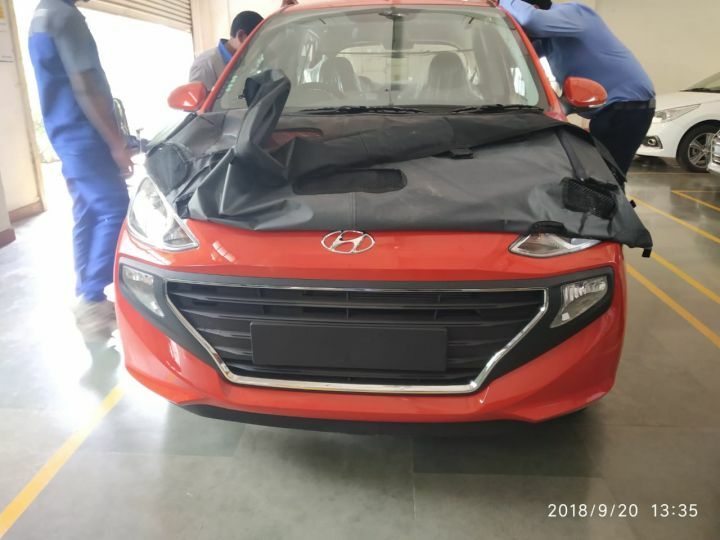 The almost flat rear-end design could hide a spacious boot, something that we did not have the chance to check out during the official Hyundai showcase at their plant near Chennai. 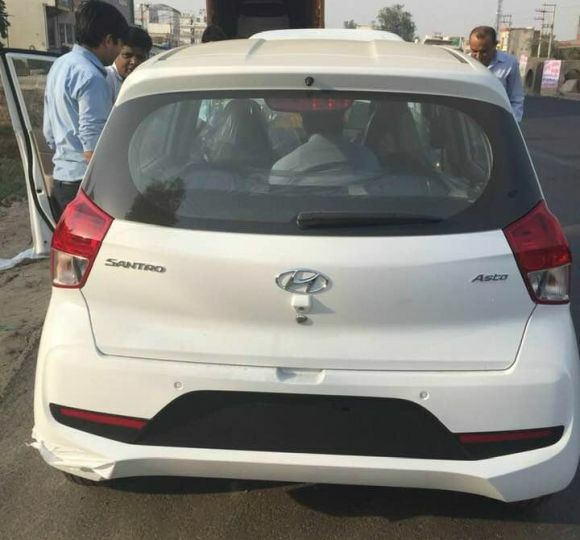 This being the Asta variant, it features a rear parking camera (which sticks out just like the one on the Elite i20) and rear parking sensors. To keep costs in check, the Santro will be offered with only two sensors rather the usual four, and this may reduce its effectiveness. A blacked out portion on the bumper reduces the bulk while also doubling up as the number plate holder. 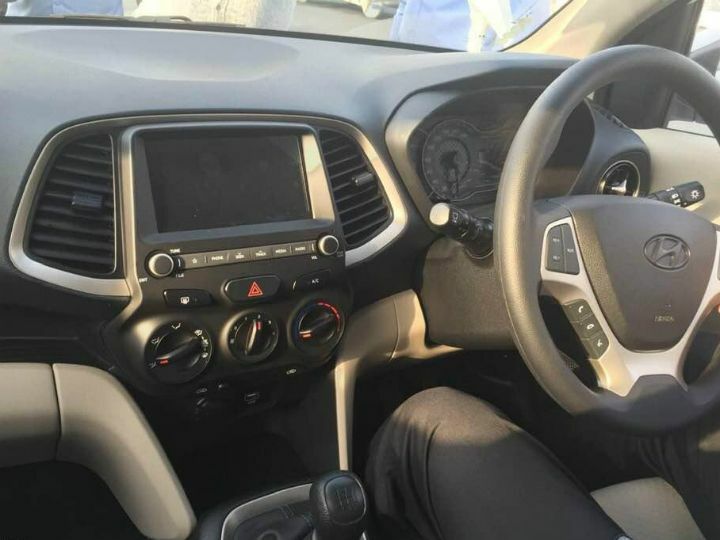 A shot of the interior shows that the Santro will feel like any other Hyundai, which should translate to good quality, feel-good materials all around. The highlights here include the 7-inch multimedia screen, a Hyundai-typical steering wheel with multi-function buttons for multimedia and telephony, manual A/C controls and a three-pod instrument cluster. 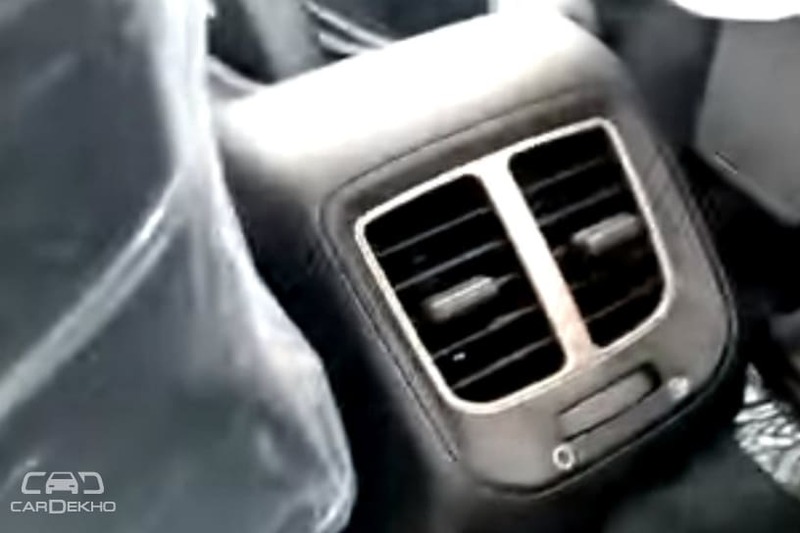 The A/C vents on the side are circular, almost looking like the ones found on Mercedes-Benz cars. Earlier spy shots have shown that these may be colour coordinated with the exterior paint. A new spy shot of the rear A/C vent has also been leaked, showing a simple setup with a single air-speed control and two directional vents. 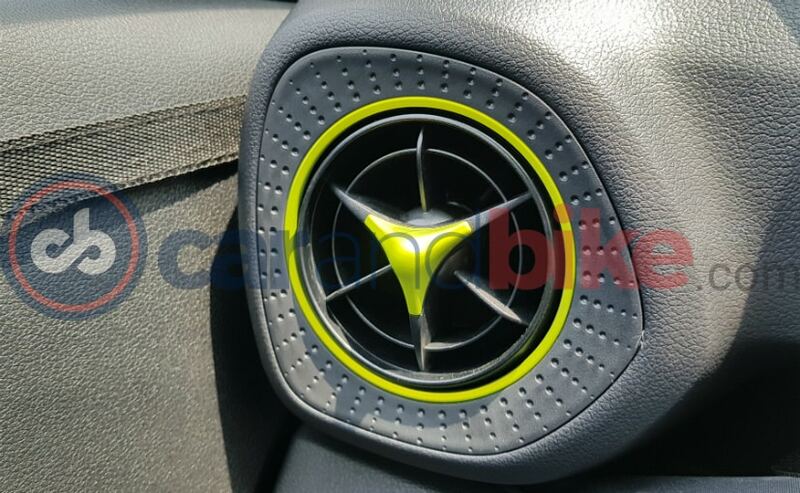 The Hyundai Santro will be the first car in its segment to feature rear A/C vents. You can find more details about the car here, stay tuned to ZigWheels for up to date news on the upcoming Hyundai Santro.